The only way to consistently, project after project, exceed our client’s expectations, is to build exceptional quality control into every step of our workflow. 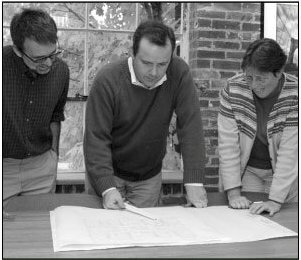 Over the years, we have developed the following four-step architectural quality control process that we apply to each project that comes through our office. Company owner and principal architect, Mike Killeen, oversees and manages every project. Principal leads initial field verification visit. Principal verifies and certifies site survey drawings. Principal is responsible for final design decisions and confirms design solutions with existing conditions drawings. Principal completes comprehensive quality control check before design drawings are issued to the client. Regular meetings are held in-house between the principal and the project team to ensure quality in the project. At four formal steps along the construction documentation process (20%, 50% 80% and 100%), the principal checks the drawings according to our 80-point checklist to ensure the drawings address all relevant matters. Principal coordinates dialogue between engineering disciplines to ensure that all are working coherently within the project. Principal is responsible for addressing all issues that might arise during construction. If hired to provide CA services, we thoroughly check the actual construction against drawings and specification to assure quality. Months and even years later, we keep in touch with clients to see how the project has performed.